Grandchildren: The little people Grandparents get to love, spoil, show off, brag about, and then send home. Grandchildren are GODS gift to parents, after raising our children. Our hearts somehow grow even bigger with love. I love mine with such intensity; it brings me joy to hear them laugh. Sadly, my husband and I have been raising our four for almost six years now. In a similar fashion, it brings me great sadness and fear knowing what they face growing up. I only barely made it through my kids elementary and middle school years without fighting a kid! I am more insanely overprotective of my grandkids as they come with an extra set of things for little bullies to extort. Full disclosure and some won’t like it. It worries me sick that someone may use racial remarks towards them. I truly worry about how I would handle that situation. Seriously, I may need bond money! And if their mom is ever brought into it… forget about it! For these reasons, referring to ourselves as grandparents just didn’t cover it. We needed something with more emphasis and authority; we are Grand-Parents. Joy and worry aside, your child’s children are complicated to raise. Balancing between spoiling and raising them as your children can get difficult. They have suffered trauma; how do we not spoil them? Consequently, their existence lies in our hands, we are responsible for raising mature, productive adults. Nonetheless, there is always someone volunteering unsolicited advise, thinking they can do it better and feeling obliged to blurt their opinion based facts out. We realize that we have slacked on some of our parental duties. The stress, depression, and anxiety that accompanies a loss such as ours made it unlikely to qualify for parenting awards. As a result, it has been impossible to make each kid do homework and read every night. We don’t sign planners or declutter their back packs frequently enough. We oversleep and run out the door without a backpack or two. Is it wrong of us to hope for a window of acceptance for slack? We are doing the best we can under these circumstances, the kids are loved unequivocally and they know it. Fortunately, we have been blessed with several amazingly supportive and understanding people in the school system and I can’t imagine where we would be without them. However, there have been people who did not seem so understanding and supportive. Thus, the reason I am writing this article. Is it hard to believe that parents and children are still be grieving after 2 years? Hell, I am not sure some of us have even hit the acceptance stage to begin the actual grieving process. The right to grieve forever! I, for one, have been so busy trying to defend the right to grieve that I haven’t. Still, I am nowhere near okay. My mental health resulting first from losing my daughter unexpectedly, and then my job, continues to suffer. I craved compassion from so many people I thought would always be there for me. Instead, I felt a sense of urgency to move on and return to normal. Some of the things said to me I can’t forget. Yet, silence from others was much louder than the ignorant words spoken. As a result, any slight confrontation was detrimental to my recovery. Loss of focus, memory and time are among my worst symptoms. However, anxiety, panic, stress, depression, nervousness, and irritability are close seconds. Even though these things kept me from being the perfect parent and role model, not just to the grandkids but also my son and husband, it didn’t keep me from putting them above myself. Having them has kept me grounded and it is my top priority to give them the best life possible. Consequently, every once in a while, I confuse what their best life should be with buying them things they haven’t earned with no valuable lesson attached. In retrospect, I can clearly see I overcompensate their loss with gifts and maybe I created little monsters. However, make no mistake, the little monsters creation was happening. The only difference is they are already home and I have nowhere to send them, so we suffer the consequences of our actions. The next time you disobey the parents and spoil the grandchildren think twice. Do you want responsibility for the creation of your own little monsters? Eventually, those little devils will bite you! I think maybe we confused the meaning of Spare the Rod. Spoil the child! I read it like a command to spoil the child and spare the rod. Actually, I think it means that if you spare the rod, you will spoil the child, like spoiling a child is a bad thing!? Laugh out Loud! Be well and please try to spare the rod without spoiling the child. Start Your Company for $49 Plus State Filing Fees! 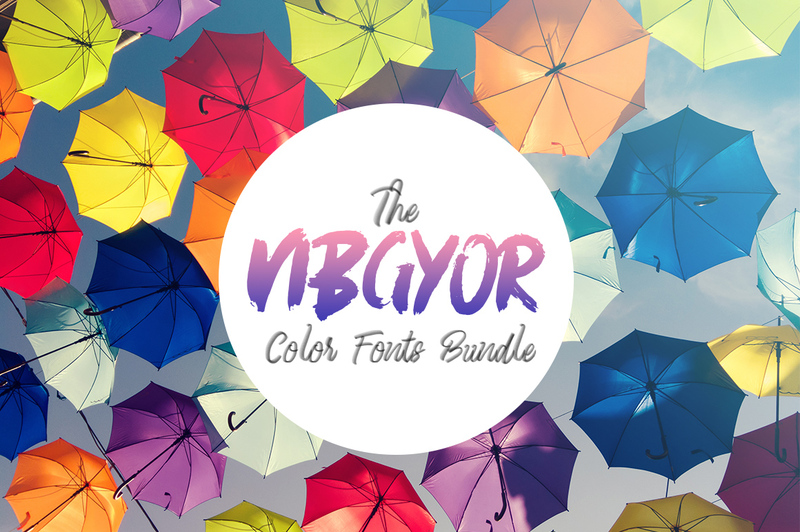 The VIBGYOR Color Fonts Bundle: 52 Font Families with 85+ Unique Fonts $29 for a limited time.